British German Forum 2017: Securing the future in a changing world to 2020 and beyond, Wilton Park, West Sussex, U.K.., 9-13 July 2017. 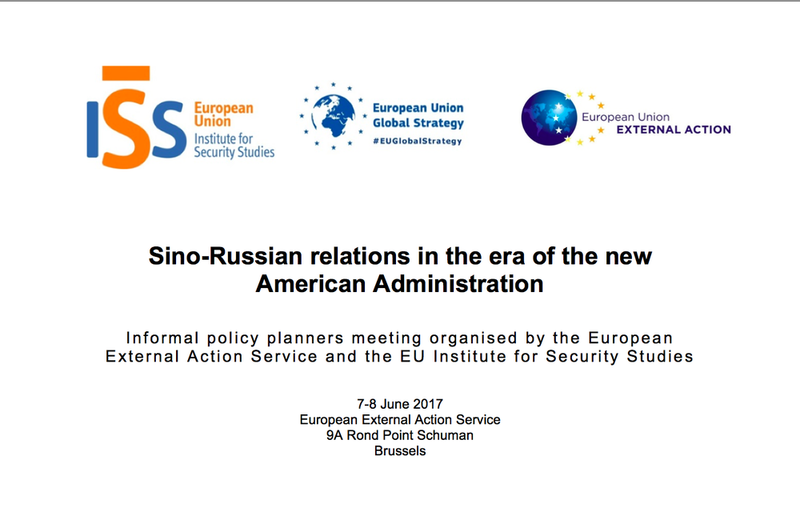 European Union Institute for Strategic Studies, European Union Global Strategy, European External Action Service, Brussels, Belgium, 7-8 June 2017. China’s Maritime Silk Road: The Case of Vado Port, Italy” International Symposium on “Maritime Silk Road: Challenges and Opportunities for Asia and Europe"
Jointly Organized by the Institute for International and Comparative Law, University of Central Lancashire, UK and the National Institute for South China Sea Studies, China held in Preston, Lancashire, United Kingdom, 4-5 May 2017. Chatham House, Zurich, Switzerland, 6-7 April 2017. Theresa Fallon gave a presentation on the New Silk Road at the Chicago Council on Global Affairs, Chicago, Illinois, U.S.A. In 2013, President Xi Jinping launched the New Silk Road Initiative as a centerpiece of China’s global strategy. Loosely based on the ancient Silk Road, the project aims to create a cohesive economic region encompassing dozens of countries in Europe, Central Asia, and East Africa through new infrastructure, strengthened trade links, and increased cultural exchange. This initiative can be seen as China’s first concerted effort to lead global development while simultaneously strengthening its influence on the world stage. What has China achieved so far and what kind of impact is the initiative having? What are the implications for the US as the Trump administration embraces a more isolationist policy? Chicago Council on Global Affairs, Chicago, IL, U.S.A., 2 March 2017. Panel on Rising China and the World: Regional Impacts and Responses, International Studies Association 58th Annual Convention, Baltimore, Maryland, 22-25 February 2017. 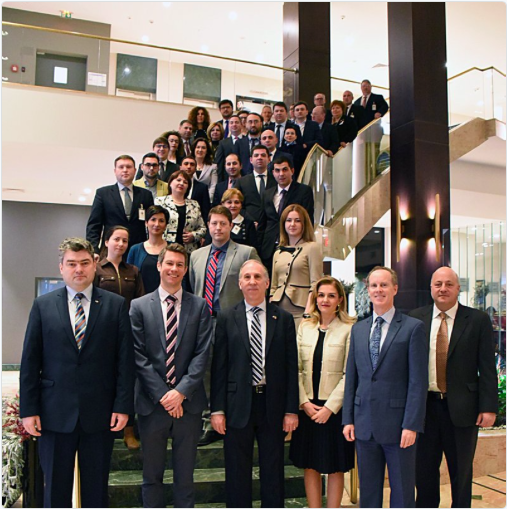 Seminar on Economic Security in the Black Sea and Eurasia Region, George C. Marshall European Center for Security Studies, Chisinau, Moldova 15-16 February 2017. Theresa Fallon spoke at the Atlantic Council in Washington, D.C. on a panel discussion on how to reinforce norms and an open, rules-based system for the international economy and the global commons-- particularly for maritime, cyberspace, and space. Theresa Fallon and Jim Fanell presented their research at the International Conference on South China Sea Disputes: Award of the Arbitral Tribunal Constituted under Annex VII to the United Nations Convention on the Law of the Sea (UNCLOS) and its Implementation. Sponsored by the Geneva Association. On November 3-4, 2016, in Honolulu, Hawaii, Theresa Fallon gave a presentation on, "The Silk Road Economic Belt: How To Win Friends and Influence Europeans". Theresa Fallon spoke on a panel with Gunnar Weigand, Managing Director of Asia and Pacific for the European External Action Service (EEAS), on "EU – China: Central Asia and Far-East Security Challenges" as part of the 12th CSDP High Level Course organized by the European Security and Defence College (ESDC) and the Belgian Royal Higher Institute for Defence on Common Security and Defence Policy (CSDP) in Brussels. Economic and Security Challenges in Asia and their Impact in Eurasia: Can the E-W Trade and Investment Corridor/New Silk Road be Shared? Theresa Fallon on "European Energy Security - Winter is Coming" panel, at Bucharest Forum 2014, held at the Palace of Parliament on October 2 - 4.